Bitcoin performed on Thursday its second positive day in the last twelve as investors found a buying zone at 6,160. BTCUSD is currently trading at 6,550, 0.15% positive on Friday. 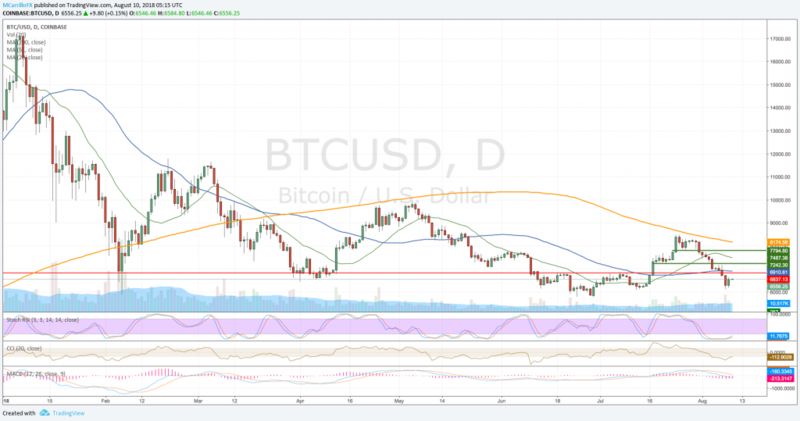 BTC/USD closed its biggest gain in August as the pair is showing some sense of bullishness. Technical conditions for the cross are bearish but turning to the upside as MACD is now returning to normal levels, while the RSI is showing less-bearish conditions. The crypto king tested the 6,100 support, and it bounced back above 6,500. If the pair consolidates levels above there, it will find next resistances at the 50-day moving average at 6,910; then, check for the 20-day moving average at 7,487, and the 200-day moving average at 8,174. To the downside, if the pair is unable to consolidate gains, a break below currently low at 6,120, would open the doors to the 6,000 critical area and the 5,800 buying zone.